MOSCOW, Russia -- Nearly three years into the war in eastern Ukraine, the Donetsk and Luhansk people's republics (DNR and LNR, respectively) are making a renewed attempt to attract foreign tourists to their internationally unrecognized statelets—with support from one of Russia's most famous crooners. 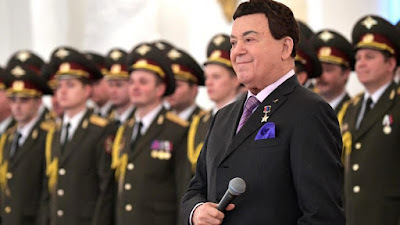 Joseph Kobzon, a celebrated singer and member of the State Duma, Russia's lower house of parliament, is leading an effort to memorialize the remnants of eastern Ukraine's once-thriving heavy industry in the latest attempt to support tourism in the Russia-backed separatist republics. Last week, an exhibit entitled “The Infrastructural Heritage of Donbass” opened at the State Duma in Moscow. The organizers of the exhibit, including the 79-year-old Kobzon, announced plans to create a “post-industrial landscape and recreation reserve” that they hope will “lead to the emergence of a large tourist cluster” in Donbass. One map displayed at the exhibit imagines a tourist route stretching from Taganrog in southern Russia to Yenakiieve, a city in Ukraine's Donetsk Oblast that is currently controlled by the DNR. The route includes a stop in Ilovaisk, the site of one of the bloodiest battles in the War in Donbass. The exhibit opened shortly after the DNR launched an initiative aimed at bringing western tourists to the conflict zone: In March, Donbass International News Agency (DONi), a news and propaganda outlet run by the DNR, announced the launch of “Donbass Tours,” a project intended to promote the Donetsk and Luhansk separatist republics internationally. Though DONi boasted about having attracted tourists from western countries to the separatist republics, business does not appear to be booming: the Donbass Tours website remains under construction more than two months after the project's supposed launch, and it is unclear whether tours planned for the May holidays (May 1-9) were ever held. Tour companies on the Russian side of the border are also expressing renewed interest in taking tourists to eastern Ukraine: a tour company in Russia's Rostov Region, which borders both separatist republics, announced that it would begin taking tourists on bus tours of the DNR, according to the local news website 161.ru. The website reported that the idea for the tour came from people within the DNR but that the program “is not yet enjoying wide popularity” and that at present most tours are organized individually. For 20,000 rubles (around $350), tourists on the “Donetsk Unconquered” excursion will travel to newly-famous battlefields, Donbass Arena (a soccer stadium that was shelled in the early days of the war), and a number of historical sites—including Saur Mogila, a prehistoric burial ground that became a battleground in 2014. In February 2015, shortly after the Battle of Debaltseve, which left hundreds of Ukrainian, separatist, and Russian soldiers killed, wounded, or missing, “Megapolis Resort,” a tour company based in Moscow, announced that it was launching excursions to Donbass and charging between two and three thousand dollars. Over the next year, multiple websites reported that the separatist republics intended to attract tourists by staging excursions in the conflict zone, though the number of tourists traveling to Donbass annually remains small: just 105,000 tourists traveled to the DNR in 2016.